For those of you not on the West Coast this weekend, most of you should only have minimal problems watching this game. 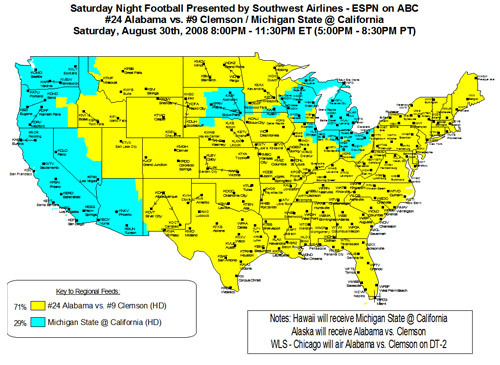 The majority of the country will get Alabama-Clemson on ABC, but Cal-Michigan State will be simulcast on ESPN Gameplan. So if your ISP pays and provides for ESPN360 (which shows Gameplan for free), you’ll be able to watch it online, smooth sailing. However, if you are one of the misfortunate souls who does not get 360 and is getting the middle finger from Mickey Mouse (because ESPN’s model of ISPs paying for their service is STUPID), you’re going to need some help. It appears someone is planning to stream the game via Sopcast, although you’ll have to download VLC player. Here are the instructions after you’ve downloaded both programs. After you’ve read the instructions, you can click onto this post that’ll give you the link to the stream (of course, around the kickoff time tomorrow); it should upload Sopcast and you can guide your way to VLC. If you’re having troubles, inquire on this thread or in this forum (be respectful; these guys are doing this for free). Warning: Watching these games online will get more and more complicated as the season goes on, especially with regional games coming up and decreased visibility around the country after the Big Game. So if any Cal fan with a strong Internet connection wants to help out poorer students and alum watch their Bears all season long (I don’t quite have the hardware or the bandwidth necessary to construct a decent stream), the instructions for uploading the stream on Sopcast are here.